Behind The Obama Portraits: Artists Put Their Own Spin On A Presidential Tradition Kehinde Wiley and Amy Sherald both typically paint vivid canvases of ordinary black subjects. "What we're positing here is a new vision of the possible," Wiley says, "one which is inclusive." Former President Barack Obama and artist Kehinde Wiley unveil his portrait during a ceremony at the Smithsonian's National Portrait Gallery. Long before Monday's official unveiling of Barack and Michelle Obama's unconventional portraits, the artists who painted them began working on details like the dress Michelle would wear and Barack's background tableau. The process began near the end of the first African-American president's final term when he chose New York-based artist Kehinde Wiley, 41, and the first lady chose Baltimore-based painter Amy Sherald, 44, to paint their portraits. Wiley and Sherald, who both generally paint lush, vivid canvases of ordinary black subjects, are the first African-American artists commissioned by the Portrait Gallery to paint a presidential couple. And with that distinction as a starting point, Wiley says the collaboration with Obama kicked off with an examination of portraiture itself. "It's one of those things that can, in a sense, remain stodgy unless you reinvigorate it with a new sense of urgency," Wiley tells Morning Edition host Steve Inskeep. Together Wiley and Obama went through art history books, looking at body language and backdrops. Wiley says the books served as a "menu" of the elements of a portrait. 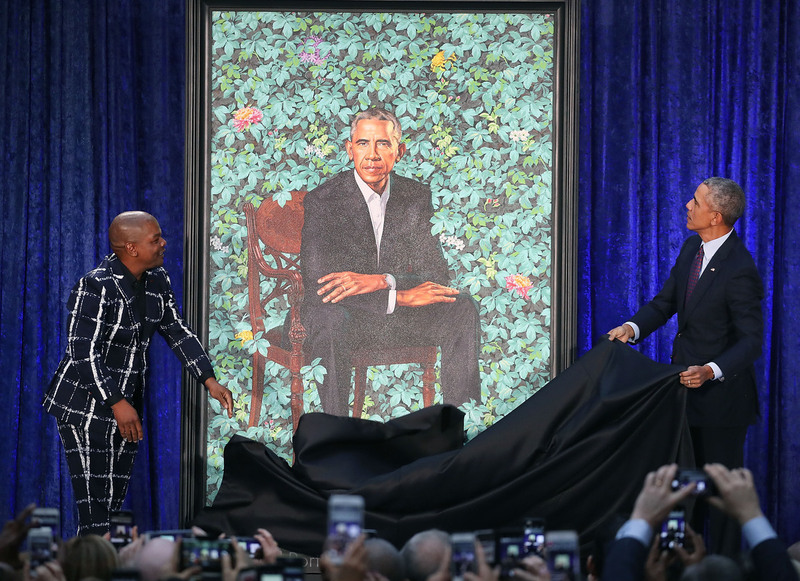 But instead of painting the traditional regal office setting or battle scene, Wiley painted a seated Obama among crisp, bright green foliage and colorful flowers. "Very quickly we arrived at the notion: As opposed to creating a type of echo of historical precedence, we should try to clear the table," Wiley says, and "start at ground level to create something that hasn't been seen before." Wiley is known for painting young African-American men in bright, bold, regal settings that are influenced by art history. At Monday's unveiling, Obama said he was struck by how Wiley's portraits "challenge our conventional views of power and privilege." Today, @KehindeWiley and @ASherald became the first black artists to create official presidential portraits for the Smithsonian. To call this experience humbling would be an understatement. Thanks to Kehinde and Amy, generations of Americans — and young people from all around the world — will visit the National Portrait Gallery and see this country through a new lens. They’ll walk out of that museum with a better sense of the America we all love. Clear-eyed. Big-hearted. Inclusive and optimistic. And I hope they’ll walk out more empowered to go and change their worlds. "He would take extraordinary care and precision and vision in recognizing the beauty and the grace and the dignity of people who are so often invisible in our lives and put them on a grand stage, on a grand scale, and force us to look and see them in ways that so often they were not," Obama said. The challenge, then, for Wiley — and for Sherald — was that neither subject was ordinary. If Wiley's impulse was to elevate his subjects, how would he depict the most powerful of people? It's one of the questions Obama asked him when they met. "He asked me about my relationship to power, and how it is that I would make a portrait that differs from that power dynamic that exists in my work heretofore," Wiley remembers. "It really came down to, 'OK, Kehinde, you really do a type of transformation. You take people from everyday life and elevate them to a level of dignity and celebration. What happens when you're painting the head of the free world? What happens in your language as an artist when you're dealing with Barack Obama as the subject of this painting?' "
The result is a work that embraces Obama's own personal story. For example, Wiley included flowers like jasmine to represent Hawaii, Obama's birthplace; African blue lilies for Kenya, the birthplace of his father; and chrysanthemums for Chicago, the birthplace of his political career. 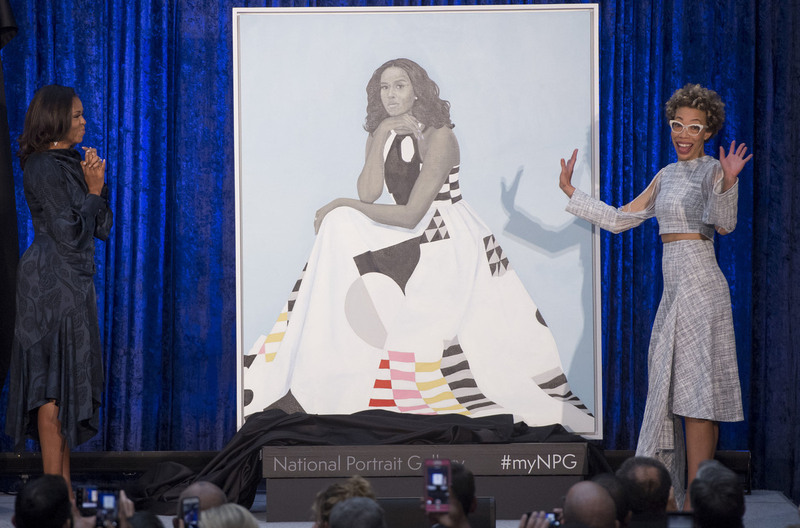 Former First Lady Michelle Obama (L) and artist Amy Sherald (R) unveil Mrs. Obama's portrait at the Smithsonian's National Portrait Gallery. Amy Sherald took a different approach to Michelle Obama's portrait. She is known for painting African-American subjects in gray scale and surrounding and dressing them in bright colors. She tells All Things Considered host Ari Shapiro that she was keenly aware of the challenge of painting an already famous person. "Michelle Obama is extraordinary, but she is also the kind of woman that exists in a way that she is 100 percent relatable to all kinds of people, all genders, all around the world," Sherald says. "And so she sits symbolically in the world in the same way I want my images to sit. They are just being themselves. And her just being herself was a profound statement that really engaged all of us because she is just accessible, and I think that she is ideally the same as the sitters that I've had before." Sherald says she and the former first lady looked at a few dresses before picking the one she ultimately wore. It's white and features a pattern that seems to nod to the geometric art of Piet Mondrian. "She's known for a lot of things and one of them is fashion, so I knew that was important," Sherald says. "I knew I wanted something that was colorful, something that had a bold kind of pattern on it. I narrowed it down to two dresses, but once I saw her in that one, I knew that was the one that she needed to be frozen in time in." Sherald says the gown, which was designed by Milly, "has a connection to the art canon, but it also speaks to black culture." Its pattern reminded her of the quilts made by the women of Gee's Bend, a small black community in Alabama. "Quilting is a huge part of black culture," Sherald says. As a young girl, even in my wildest dreams, I never could have imagined this moment. Nobody in my family has ever had a portrait - there are no portraits of the Robinsons or the Shields from the South Side of Chicago. This is all a little bit overwhelming, especially when I think about all of the young people who will visit the National Portrait Gallery and see this, including so many young girls and young girls of color who don’t often see their images displayed in beautiful and iconic ways. I am so proud to help make that kind of history. But the fact is that none of this would be possible without the extraordinary artist and woman behind this portrait, @asherald. Thank you, Amy – it was a joy to work with you and get to know you. Despite the famous subjects, both artists say their portraits are consistent with their established style. But if you ask Wiley whether his painting makes sense among the other presidential portraits at the National Portrait Gallery, he says, "I think it fits in, and it doesn't fit in." It does because his Obama portrait is one in a long line of celebrations of the American presidency — and it includes some basic, familiar elements of portraiture. But ultimately, it presents something new. "What we're positing here is a new vision of the possible," Wiley says,"one which is inclusive, one that says yes to people who happen to look like me and one that will increasingly catch fire as we go on to inspire young people to imagine new possibilities." Barton Girdwood produced the broadcast version of this story.